Pressure cooking is convenient for so many things, and one place where it really shines is with frozen chicken. If you keep frozen chicken breasts or thighs on hand, you can always have some protein ready in a pinch, making dinner prep that much easier. I’ve found that frozen chicken cooks up best when it’s at least halfway submerged in liquid. This can be either water or broth— just make sure you lay the pieces in the bottom of the pot in a single layer and add at least a cup of liquid. You can cook the chicken on its own this way, or incorporate it into a recipe. I often make a straight-from-the freezer soup by layering in mixed frozen vegetables, a can of diced tomatoes, herbs and salt to taste, and water to cover. When the soup is done, I remove the chicken with tongs, shred it up with a pair of forks, then add it back to the pot. Frozen boneless chicken breasts and thighs are commonly sold in the freezer aisle, found in bags, already individually frozen. 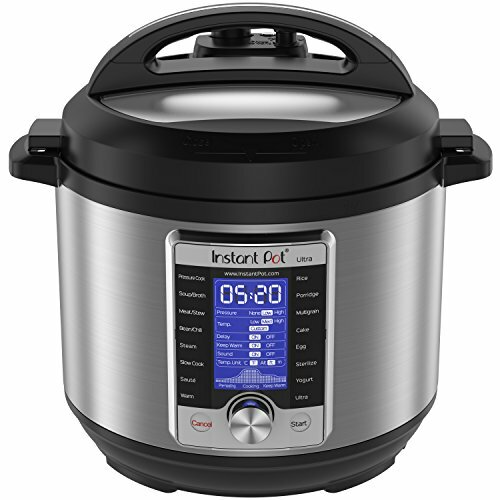 This is ideal for pressure cooking. If you’re freezing your own chicken parts, make sure you freeze the pieces individually, rather than in a thick, solid block. This way, the chicken cooks more quickly and evenly straight from the freezer. My favorite way to do freeze my own chicken is to individually wrap breasts or thighs in plastic wrap, freeze them flat on a baking sheet for a few hours, then transfer them to gallon freezer bags. They don’t get stuck together, and you can cook as many or as few as you want at a time. To cook frozen chicken breasts or thighs, use the times given here and follow the basic method for How To Cook Chicken in the Pressure Cooker. In short, you’ll add the chicken to the pot with some water and seasonings, then close up the pot and cook at high pressure. Since the chicken goes in the pot frozen, I tack on a few extra minutes to ensure that it’s cooked through. See the times below for cooking times for boneless and bone-in breasts and thighs. For extra flavor and to speed up the time the pot takes to come up to pressure, you can also brown the frozen meat in a little bit of oil before adding the liquid, if you like! This chart details cooking times for different types of frozen chicken parts. For best results, use a maximum of two pounds of meat, frozen in individual pieces, place it in the pot in a single, even layer, and use at least one cup of liquid.